Can design have an impact on the practical realities of everyday life? A slowdown usually impacts office real estate in the form of slashed budgets or relocation to smaller (and perhaps less inspiring) workplaces. But a little imagination can go a long way in working around many common site constraints. Physical limitations are always a challenge. One can avoid bruised egos and bite-sized cubicles, though, when moving to a smaller workplace. New Delhi-based Sabyasachi Sen and Associates were asked to relocate the office and library of the British Council in Kolkata from a generous 15,000 sq. ft, to a compact 7,000 sq. ft.
Dimensions of partitions and storage units were tweaked to suit the council’s needs. Divider panels between workstations were lowered to allow for greater personal contact, and desks were extended to accommodate each team’s printer. Flat screen monitors saved space by reducing the depth of the workstation and eliminating the need for a keyboard tray. Creative use of storage units in particular — as partition walls and as a support for printers — allowed the council’s staff to move without losing precious data storage space. Artful navigation of company hierarchy solved the dual issues of too much, and too little, space. Senior managers were allotted sheer square footage while junior office workers were placed in the double-height area with maximum volume, enjoying unparalleled ceiling heights. At the same time, “islands" of workstations were located to create intimacy so that no one felt lost. The same colour palette was deftly applied to seating, furniture systems, niches in the walls, ceilings and columns to divert attention from height differences. Creating the illusion of a large space is an integral part of an architect’s repertoire. Mirrors, glass partitions and whitewashed walls are trademark devices to enlarge an area. Nayan Shah of Ahmedabad-based Studio Eethetics took a bolder route when asked to visually expand a 270 sq. ft office for Achal Shah, a structural engineer based in Ahmedabad. He redefined the volume of the structural engineer’s office by inserting two strong vertical insertions in the cubic shell. Large, porthole-like punctures in the two partitioned walls divided the office into two distinct work areas while simultaneously ensuring a continuous telescopic view from each end of the width of the space. The dark floor became a smooth, deft plane into which the circular cut-outs seem to be embedded. 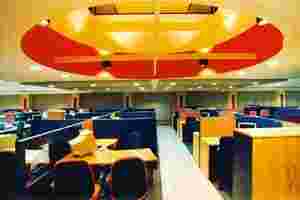 The Mumbai office of Birla Sun Life Insurance was located in a long and narrow space, with low ceilings. Architect Aruni Patil of Mumbai-based Anurup Designs devised a strategically placed cut-out in the ceiling to give the feel of a vaulted space. 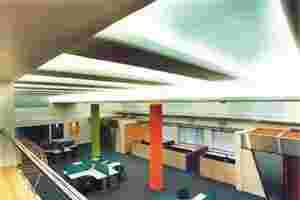 The colourful, lit cut-out gave life to the workstations and nullified the linear constraints of the site.